Do all tropical pumpkin fruit shapes taste the same? ‘Tahitian Butternut’ pumpkins are characterized by their elongated, club-shaped fruits with dark-orange flesh. As cross pollination (between varieties) occurs, however, their fruit shape can become quite variable. 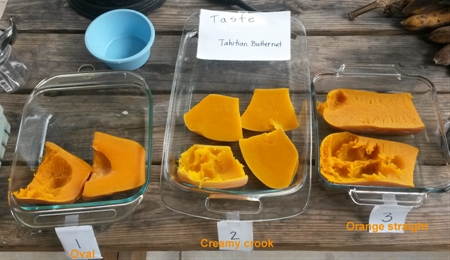 Between 10 and 13 people rated the texture, creaminess, butteriness, and overall taste of the above types/shapes of ‘Tahitian Butternut’ pumpkins (pictured in Figure 1). Each of these parameters was rated on a scale of 1 to 5 with 1 being the least desirable and 5 being the most desirable. Figure 1. Pumpkins that taste test participants were asked to assess. The fruit shapes are labeled in orange letters in this photo; however, during the taste test, to avoid bias, the shapes were labeled with numbers (1 to 3) only. 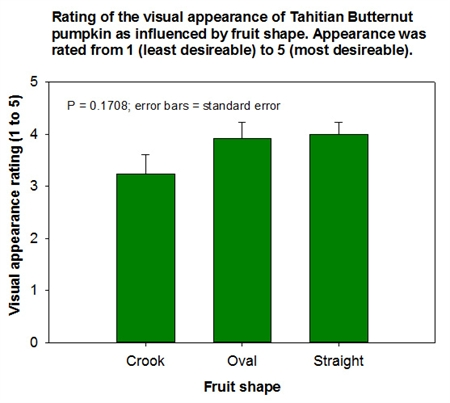 Each participant was also asked to rate the overall appearance of the various pumpkin shapes (Figure 2). To avoid the possibility of associating a favorite shape with most-favored taste, the fruit shapes in the taste test were keyed to different numbers than for the visual test. For example, the number ”1” represented oval fruits in the taste test (Figure 1) and crook-necked fruits in the visual test (Figure 2). Figure 2. Pumpkins that visual test participants were asked to assess. The fruit shapes are labeled in orange letters in this photo; however, during the taste test, to avoid bias, the shapes were labeled with numbers (1 to 3) only. In terms of taste, the favorite among ECHO staff was “orange straight,” which received a higher rating than “oval” and “creamy crook” (Figure 3). Oval and crook-shaped fruits were rated similarly (statistically), with both shapes rated lower than the “orange straight” fruit. Results for texture, creaminess, and butteriness were similar to that shown below for overall taste. Figure 3. Results for overall taste. 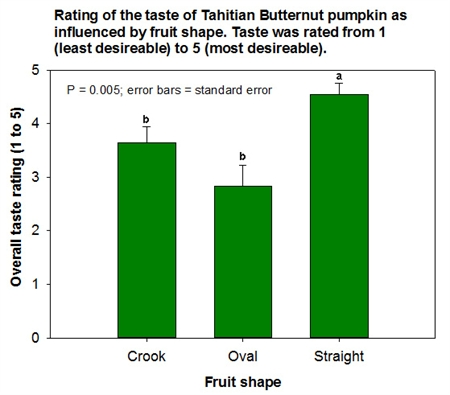 As far as visual appearance, there was no significant difference between pumpkin shapes (Figure 4). Numerically, the oval and straight fruits were rated slightly higher than crook-necked fruits, but the difference was not statistically significant. Figure 4. Results for overall appearance. When introducing a new food plant, it is easy to concentrate our efforts on growing the crop. Taste and visual preferences, as well as cooking aspects, should also be considered. Straight-shaped pumpkins are probably easier to handle as far as cooking and food prep than crook-necked fruits, so the fact that they also tasted the best could be significant from a culinary perspective. Recognize, though, that taste and visual preferences could vary between different groups of people.